There are three types of tax you have to pay when trading shares, capital gains tax, income tax and stamp duty. However you need not worry about calculating stamp duty as it is dealt with by your broker when you enter a trade. The current stamp duty you pay on entering a trade is 0.5% so if you buy £10,000 worth of stock you will have to pay £50 straight to the government. Capital Gains Tax is paid when you make profits from your shares. Any losses from your shares can be deducted from the profits to reduce the amount of capital gains tax you have to pay. The other type of tax you pay, income tax, is only due if you receive money from stock dividends. Note that you also pay income tax on your salary (wage) therefore you need to add money received from dividends to your salary before working out how much income tax needs to be paid. Capital gains tax must be paid by the 31st January each year. 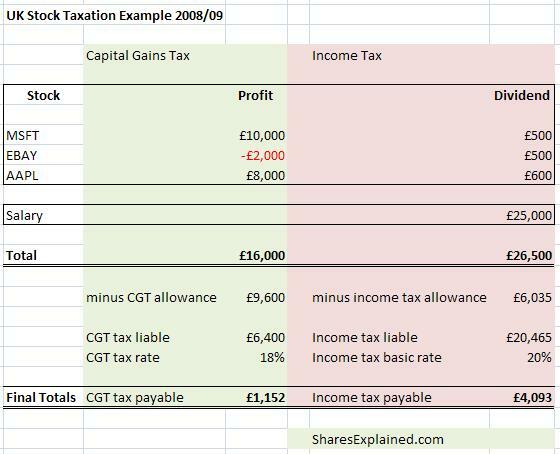 The current 2008/2009 tax free allowance is £9,600, and gains over £9,600 will be liable for CGT. Income tax must be paid by the 5th of April and the current 2008/2008 tax relief is £6,035. Any income earned over £6,035 in the year will be liable for income tax. For more detailed information on capital gains tax and income tax in the UK check out the government official webpages at www.hmrc.gov.uk. If you are from outside of the USA why not have a look at spread betting accounts where capital gains tax is not applicable to winnings. Unsure what spread betting is? Spread betting explained. Taxation laws on stocks in the US are slightly simpler than in the UK. In the US people pay only one tax that is income tax. Their capital gains on stocks are simply added to a persons income tax. Like in the UK, capital losses can be offset against capital gains to reduce the amount of tax to be paid. People in the US also have two tax allowances, a standard deduction and a personal allowance that they can take off their gross income. First of all to work out the tax needed to be paid on capital gains you need to know the income tax bracket you belong to. Note:If you were single and your net income comes to $25,000 you would only pay 10% tax on the first $8,350 and 15% tax on the rest. 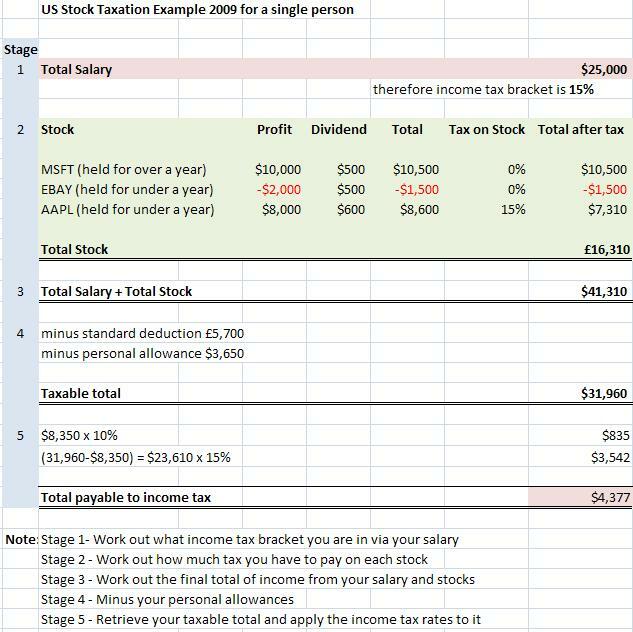 Secondly, once you know your income tax bracket you can work out how much tax you need to pay on your capital gains using the table below. Find out how you can make money in a declining stock market – shorting stock. Don’t have time to trade shares yourself? Mutual funds basics. It is all very helpful but what if I am leaving in UK but trading US shares in dollars using for example MB Trading or Option Express. How much i have to pay in taxes in this situation? And what about £/$ exchange rates which are changing constantly? If you are living in the UK you will usually pay UK taxes. The UK has signed a tax agreement with many countries stating tax is only payable in one country if foreign investments are made – see more at the UK governments tax website. As for the exchange rate you will need to check what the base currency is in your brokerage account. Some brokers allow you to keep a GBP balance, some a USD balance and some a mix of both! This is really a question for you broker. However it is worth noting any foreign investment will be heavily influenced by the exchange rate. Thanks – this is useful. If the capital gains tax rates in the US change in 2013, they may likely go up. If as a non UK resident, I pay UK capital gains on UK share sales, do I also pay the new higher US capital gains on UK share sales too? Hi Ron, as far as I am aware, you should only pay tax in one country (your native USA?). The UK and USA have a tax treaty, which allows investors to only pay tax in one country. However I am not a qualified tax adviser, and you should always seek professional tax advice if unsure. After leaving my company I received shares as part of a bonus scheme. They “sold to cover” on my behalf but only at basic tax rate. I now have to pay the difference up to 50% on them – even although I haven’t actually sold them yet therefore haven’t had any cash from them – is this right? Can someone use just a brokerage account to buy mutiple shares(i.e. Shares from different companies)? Yes is the simple answer to your question! Hi there Shahzeb – In the US, there are two tax rates that apply to gains on stock sales (called Capital Gains) – there are short-term and long-term capital gains tax rates. The short-term rate applies to any gains on stocks held for less than one year. The long-term rate applies to any gains on stocks held for at least one year. Generally speaking, your short-term capital gains tax rate is your effective tax rate on your entire income – so if you are unemployed and have a very low tax rate for a given year, your capital gains rate for that year should indeed be quite low. If this is a long-term gain, the rate has generally been lower (you are basically being rewarded for a longer holding period) and in the 0-20% range. If you overall tax rate is very low, you might qualify for the 0% long-term rate. The tax code is complex, so it’s advisable to read the IRS publications very thoroughly or to consult with a tax adviser. Thanks for the info. After reading all the comments here, I have one doubt: if I live in the UK but have shares in the US through an American broker and US bank account… do I have to pay taxes in the UK if I sell one stock and then buy another one? I mean: I never transfer the money back to the UK. I wont sale my stock but no money to pay tax in advance,how to pay tax.This is for IRS.If no money to pay tax, what will happen with money from my stock. Thank you. Hello Nedeljko – You would almost never pay tax at the time of sale when selling shares. Generally, when selling your shares, the entire proceeds of the sale are made available to you. You then pay the tax on the gain when you file your tax return at the end of the year. Or if you have a loss, you may have a tax deduction. If you have both gains and losses from different stock sales, you may end up not having to pay any tax on it at all.